I'm no astronomer, but this message about the Orionid meteor shower, which is doing the rounds on Facebook, seemed worth sharing. 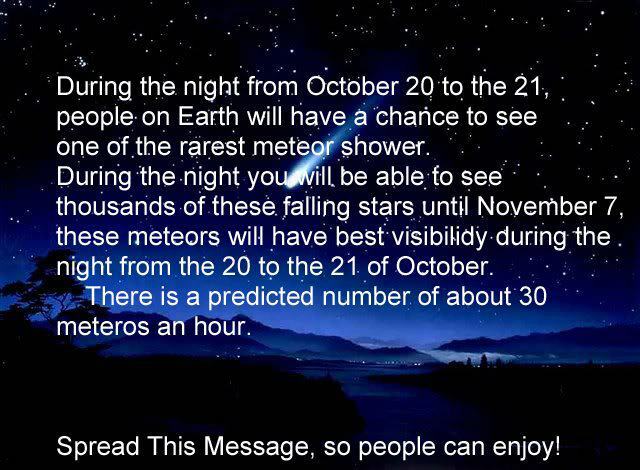 Yes, I know it has spelling mistakes - and a little research has shown me that the Orionids occur every year, so aren't exactly rare - but the message is correct in saying that the night of 20 to 21 October should be the best time to see them, if we get a clear sky. The Orionids are fast-moving meteors that often leave bright fireballs in their wake, which can be seen from the UK at this time of year, especially at around the time of the new moon. According to the website EarthSky: "If you trace these meteors backward, they seem to come from the club of the famous constellation Orion the Hunter."